The UK’s recent referendum in the Malvinas-Falklands suggests that neither side in the dispute is serious about finding a lasting solution. Few observers were surprised that the overwhelming majority of the islands’ residents – all but three of the 1,517 persons casting ballots – would vote to “retain their current political status as an Overseas Territory of the United Kingdom.” Since the war in 1982, London’s decision to station 8,000 troops (more than four times the local population) and decentralization of control over fisheries have enabled islanders to enjoy one of the hemisphere’s highest standards of living. The UK government has encouraged a blossoming of British identity on the islands. British and Argentine political leaders couldn’t resist the opportunity to demagogue the results of the referendum. Prime Minister David Cameron said the islanders are “British through and through and that is how they want to stay,” and he warned that Argentina should take “careful note” because “we will always be there to defend them.” In a series of 27 tweets in two hours, President Cristina Fernández de Kirchner ridiculed the referendum. “An English territory more than 12,000 kilometers away?” she asked. “The question is not even worthy of a kindergarten of three-year-olds.” She called the residents of the islands a “transplanted population.” Foreign Minister Hector Timmerman threatened legal action against firms helping explore for oil around the islands, and both houses of the Argentine Congress voted unanimously to condemn the referendum. Washington has stayed on the sidelines despite its strategic alliance with London and tensions with Buenos Aires. Both countries have changed greatly since 1982, and the chance that the rhetoric will escalate into greater tensions seems remote. But nationalism, symbolism and opportunism continue to dominate the Malvinas-Falklands issue 30 years after a war and in the second decade of a new century. With their economies in bad shape, the current governments in both London and Buenos Aires may welcome the international distraction. The prospect of rich offshore oil deposits around the islands has raised the stakes, with both countries accusing the other of wanting the islands merely for their natural resources. Argentina, moreover, seems intent on pushing its neighbors into supporting its stance on the islands, exposing them to the contradiction between the two important principles at play – a historical claim of sovereignty versus a current referendum of clear popular will rejecting it. Of the two corners that the UK and Argentina have painted themselves into, Argentina’s is more complex and will require a more patient, long-term approach involving, perhaps, United Nations mediation. 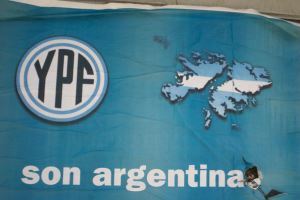 Kirchner has expressed hope that the new Pope could act as a mediator in the Falklands-Malvinas dispute, yet his Argentine nationality and past comments that the islands belong to Argentina make that implausible. It is clear that putting the issue on the front burner and trying to drag the rest of the continent into the debate has not served Buenos Aires’ interests well. The UK’s referendum is unhelpful, but President Kirchner still has room to tone down the rhetoric and threats, and avoid letting a tactical setback lead to a strategic blunder. Chances of that happening are better under her successor, and the next election isn’t until 2015. Is the truth finally arriving in El Salvador?